Avebury stone circles are part of a UNESCO world heritage site, which also includes Stonehenge. It’s a thrill to wander among the complex of several circles, chalk banks and avenues of stone. Nearby, are two other amazing prehistoric monuments Silbury Hill and West Kennet Long Barrow. At Avebury visitors can walk among the stones and feel the scale of the monument. I like to walk around part of the bank and up to the Swindon stone and some other of my favourites. Yes it’s possible to have favourite stones! Walking along the best preserved of the avenues is inspirational. As at Tintagel archaeologist are finding there still more to be discovered at Avebury. I offer this tour as part of a transfer to Cornwall from London. If we are traveling direct to Cornwall, this tour takes a good half-day, before we set off to Glastonbury. We can also stay longer and enjoy Avebury mannor, a National Trust Property. 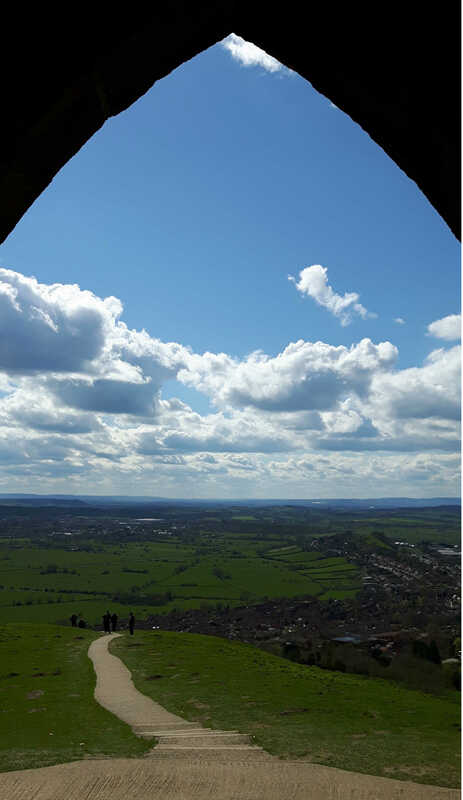 Glastonbury tor is a natural geological extrusion that is more magical than it is possible to describe. 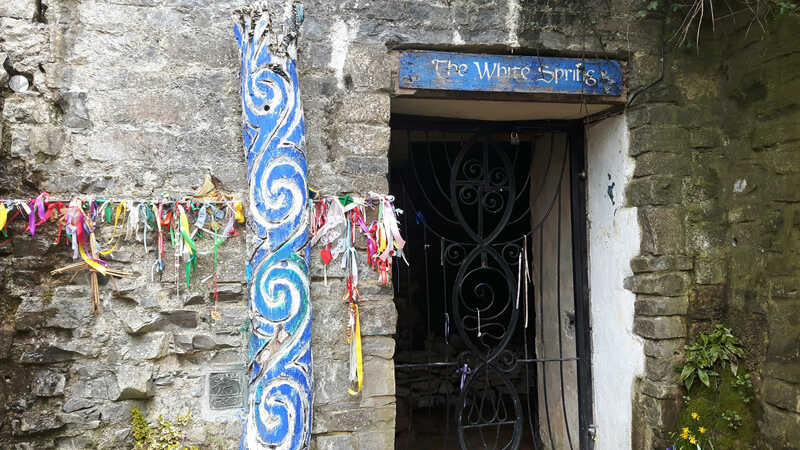 I love to visit Glastonbury because like Tintagel, despite the commercialism, it is still possible to feel the legends come alive. When you climb the tor to St Michael’s church tower the views are breathtaking and so is the climb. The tor is surrounded by mysterious patterns in the ground, the cause and purpose of which are open to debate. We can visit Glastonbury Abbey, the Red and White Springs and Glastonbury tor itself. The Abbey is said to be the location where the tombs of King Arthur and Guinevere were discovered by the monks in 1191. A story not to be dismissed as easily as some people do. Glastonbury Abbey was a powerful and important place before the Reformation. 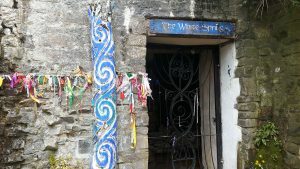 My favourite place in Glastonbury is The White Spring. It is staffed by volunteers who seem drawn to it, as if under a spell. I think that there’s something for everyone in Glastonbury. Touring Glastonbury takes the second half of the day before we head to Cornwall. We might also squeeze in a visit Cadbury Castle. Cadbury is nearby to Glastonbury and a strong contender among the locations vying for the title of Camelot. It is one of the few Iron Age fortifications showing signs of post-Roman occupation, it’s a must for the serious King Arthur fan. If you are looking for a private transfer to Cornwall from London or elsewhere, I may be able to help you. I now offer trips down to Cornwall from London, with stops along the way at magical places. I usually meet customers in Swindon, just a short train ride from central London. Our tour down into Cornwall can include combinations of Avebury, Glastonbury, Stonehenge, Salisbury and Bath. If you would like to see all of this places it will take more than a day and require overnight stops. When we reach Cornwall there are delightful options for days exploring the county. These tours are designed to work around your requirements. Please do get in touch to let me know what you need. How much is the transfer and tour? A typical one day transfer from London to Cornwall, stopping at Avebury and Glastonbury is a minimum £500. This includes four people and their luggage. My Land Rover Defender does seat six passengers. A party of six with light luggage can be accommodated. This is only if the bags are light enough to be passed overhead and stored on the roof of the vehicle.